Barcode Printers Market size will reach USD 3.5 billion by 2024; according to a new research report by Global Market Insights, Inc. The shipments will grow at around 7% CAGR from 2018 to 2024. 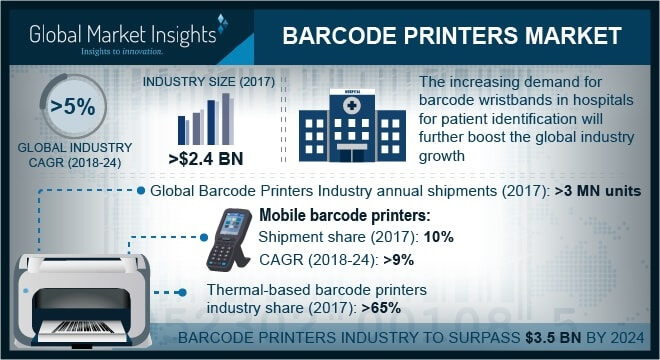 The increasing demand for barcode wristbands in the healthcare sector for patient identification is anticipated to have a positive impact on the barcode printers market growth. Hospitals across the globe are mandating policies, which require the patients to wear a barcode identification band during their stay in the hospital. Barcode bands allow hospital staffs to provide speedy and accurate data entry, reducing the medical errors. It helps in enhancing the efficiency as compared to the physical entry of data. The global ongoing trade developments are anticipated to drive the barcode printers market growth over the forecast timeline. The growth can be attributed to the increasing number of shipments exported or imported, labeled & coded with barcodes for recording and storing the data associated with the goods and products. The barcode technology is being increasingly utilized in the retail sector where it has become a standard for labeling and storing the product’s data, allowing the staff to offer smooth services to the customers. The growth in the retail industry can be accredited to the rising disposable incomes, providing a boost to the e-commerce sector, positively driving the barcode printers market growth. Thermal-based printers comprise more than 65 percent of the overall barcode printers market share. Due to the features, such as high speed, low noise, and ease-of-cleaning and reliability offered, the thermal-based printers are increasingly utilized across several applications. The direct thermal technology is expected to witness growth over the forecast time span owing to the improved durability and low operational costs. These systems are ideal solutions for applications such as shipping labels and printing receipts and can develop barcode images on the material without a ribbon, making it eco-friendly. The barcode printers market is highly competitive, witnessing intense competition among the players. Furthermore, the industry is slightly dynamic in nature characterized by innovations and advancements in the product portfolio. Players are making huge investments and spending a significant share of the revenue on the research & development. Prices of products as well as the manufacturing costs are predicted to decline owing to the maturity of products & technologies. The industry is characterized by the increasing demand for customized product solutions, evolving industry standards, distribution channels, changing security protocols, and frequent introduction of new products & services. To remain competitive in the industry, companies are increasingly focusing on providing superior customer service, high levels of quality & reliability, efficient & dependable distribution networks, and technologically-advanced systems. The barcode printers market provides significant growth opportunities for the component & raw material suppliers, manufacturers, integrators, and distributors in terms of revenue share.